How To Chum for Pilchards (whitebait): You have your cast net, you've practiced throwing it in the yard 100 times and you're ready to go catch bait! Head out to your chosen bait spot about an hour before sunrise and anchor up. There are several reasons why it's advantageous to get bait in the morning before sunrise. Foremost being that it's the easiest time of day to get them. The reason why is as the sun rises, the bait can see you and the net coming. This can result in the bait staying away from your boat, and just out of casting range. The better they can see the net coming, the easier it is for them to dart and swim out from under it. Finally, if you can fill your baitwell and get to the best fishing hole early in the morning before anyone else does, your chances of success increase substantially. Anchor up on the edge of the flat or sandbar in about 3 to 6 feet of water. Wait a moment and let the current of the tide point you in the right direction. Make sure the boat doesn't move and you're well anchored. Usually you'll anchor off the bow (front) and throw your cast net from the stern (back). When you throw chum into the water, the current will carry the scents and oils out to the bait and attract them to the source. This will create a slick and trail for them to follow. Once you have established the direction your slick will go, it's time to chum. How To Use Chum To Lure Bait Fish: Grab 2 handfuls of chum and throw them in the water next to the boat to get the slick started. If you can see bait in the area, your goal is to create a chum slick with the current that will travel to where they are and bring them over to you. Don't mix it with water to make balls and plop them into the water. That slash will scare the bait away. Just sprinkle in a couple handfuls next to the boat and allow it to disperse. Now it's time to turn on your baitwell, and get the cast net out. Make sure your net isn't tangled or twisted and ready to load. Be quiet! This is when a lot of anglers make the huge mistake of banging their net on the bottom of the boat, slamming the hatches closed, etc. Bait fish like Pilchards are weary and skittish. They have two missions in life; eat and not get eaten. Noises and movement scare them away. While you were quietly getting prepared, the chum has been working it's way through the water column and establishing your slick. You may notice the bait moving towards you already. Be patient and let them get close. Stay as low and quiet as possible. Don't stand up on the back deck tossing chum. These fish get attacked all day every day and if they see you, they will stay away. If possible, kneel down next to the center consul and sprinkle about a golf ball size amount of chum into the water right next to the boat every 15 to 20 seconds. The chum will sink to the bottom quickly and then begin to rise back up to the surface. This will result in two things: First it will separate the pinfish from the whitebait. Second it will get the whitebait concentrated in your target casting area. Pinfish are aggressive and will literally eat the eyes out the bait fish. 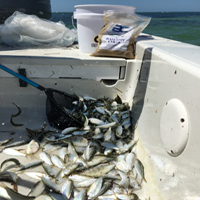 If you've gone to a good spot for bait and only caught pinfish, chances are they are keeping the bait fish at a distance. Greenbacks, Pilchards, Scaled Sardines and Threadfin Herring will not compete with the pins for food. Because our Boca chum begins to float after sinking, you can use this to your advantage. The pinfish will feed on the chum at the bottom, right next to the boat. They prefer to feed off the bottom and they are not so scared of you or the boat. The chum that rises up in the water column will catch the current and suspend near the surface about 10 to 15 feet away. This is where the coveted bait fish (pilchards, whitebait, greenbacks) prefer to feed. About 10 to 15 feet from where you initially throw your chum into the water, you'll notice the bait balling up. It will often look like raindrops popping on the surface and you might see them flashing and darting through the slick. This should be right were your target area is for the cast net. Quietly get the net loaded in one hand, grab a small handful of chum and slowly step up onto the deck. Get into position and toss the handful of chum about five feet up current from the center of your target area. Finish loading the cast net into your hands and get ready to throw. Wait a few seconds for them to swarm into that area of chum you just tossed in which should now be dead center of your target casting area. Cast the net and whack em! Make that first throw count (no pressure) because after that, it can take a while to get them back to the boat. Many of our expert guides will toss another handful of chum into the water as the net sinks so it can be working on the next round while they're clearing the catch from the net. If you can load up and catch 100 pilchards on your first throw, then you may be part of the "one and done" club. It's a pretty nice feeling out head out to your favorite fishing hole with baitwell so thick you can't see the bottom after one toss. The Best Place To Find Bait: Most fishermen will not tell you where their favorite fishing hole is, but most will tell you where to find bait. Ask around and you'll find that "the spot" is well known and popular for most of the live bait anglers in your area. This means there will likely be several boats in that area catching bait each morning. Local tackle shops that carry and sell the chum will gladly tell you where to use it. Online groups like our Facebook group at Boca Coast Florida are also a great resource for the current bait situation. Chumming for pilchards is most common from Tampa Bay to the Florida Keys along the Southwest coast of Florida. Once you have a general idea on where to go, you'll want to slowly approach the area. If you're doing it right, it will still be dark with the light of dawn being 30-45 minutes away. There will be other boats in the area to be cautious of as well. This is the time for stealth and a pause. Assess the situation and look for indications of bait. Look for diving birds. They're diving on bait. Especially the pelicans. Pilchards and threadfin herring will school up and Pop on the surface. This looks like raindrops from a distance. Finally, look for flashes just under the surface. They are always on the move and often turn suddenly, which results in flashes from their scales. It's very important to locate them if possible before setting up to cast the net. If you have located a school of bait or at least have a good idea of where they are, you'll next want to figure out which direction the tide is going. If you're doing it right, you've been drifting with the current for a minute or two and already know the direction. Get yourself anchored up current from where the bait is so you can use the chum slick to bring them in. If there are other boats in the area, do not drive through their slick! Keep at least 5 boat lengths between you and other boats at all times. Beyond being courteous, you don't want to scatter the bait between the boats. Go around and ahead them to get into a position up current from the bait and slowly ease back into position. Be quiet! Use your trolling motor and don't toss your anchor into the water making a big splash. Make sure you have a clear unobstructed line for your chum slick to the bait. You want your own clear trail leading them to your boat. If your slick has another boat in it, that's where the bait will stop and the other guy will catch them all. Flats and sandbars that are near passes or deep water channels are typically the best places to chum up bait fish. This depends on the time of year and water temperature. In the winter time the bait tends to be in deeper water and they want to stay on the bottom. This is when you'll want to find structure like a bridge or channel marker where you can use the chum to bring them up off the bottom. In the middle of the summer, the beach turns into a hot spot. The bait runs along the beach and you can see large schools in shallow water. This is also when the large predators like snook and tarpon are in the area feeding on that bait. If you've been chumming for 20 minutes or more and perhaps tossed the net to see if anything is there, it may be time to move if you come up empty. You can have the all the best chum in the world, but if they simply aren't there, then you might as well be chumming in a bath tub. Stop and look around for the signs of bait and move. You may just need to move 100 feet or as far as 1000 yards away to find them. This is fishing after all. Often times adapting to the situation and moving around is necessary. This is another reason it helps to get out early. There are as many homemade recipes and combinations for chum as there are fishermen tossing it in the ocean. Most of us know how to make and have been using some combination of Purina Tropical Fish Food powder mixed up with saltwater in a bucket and combined with Menhaden or Pogie oil for years. 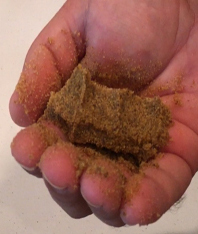 There are two different types of Purina Tropical Fish Food that anglers use for chum. There's the 33% and 45% which refers to the percentage of menhaden oil in the powder. Feed stores have both for sale in bulk 50 pound bags. Unless you're a full time commercial guide, this will probably go bad before you're able to use it. You'll also have an open invitation to mice and roaches like you've never seen before. Captains and Professional Anglers: We owe a Huge thanks to all the experts that helped us develop this recipe and tested it over the last year. You guys are the best at what you do and this product is the result of your suggestions and feedback. Todd Gilbert, Josh Prunier, Mark Howard, David Spargur, Jason Sherrill, Milton Bontrager, Dave Stephens, James Twiztidone Creutz, Steve Whitlock, Rick Baker, Jeff Holt, Wes Wildman, Dave Abel, James Marko, Nate Weisman, Jay Withers, John Conway, Kevin Lubold, Jason Semeyn, Karl Butigian, Lou Silva, Drew Underwood. Conclusion: Get out on the water before sunrise if possible. Take a moment to figure out where the bait is, the direction of the current and where you're going to anchor the boat. The best charter captains and guides have been using this Boca Coast Chum with great success right along with weekend warriors. That fact that our chum actively works for you while you're trying to attract and catch bait gives you a huge advantage. No more mixing and chumming for hours, trying to get enough bait for the day. Use the techniques provided on this page and you'll catch more bait, faster than you ever did before. If you're learning how to catch your own bait for a great day of fishing, you've just discovered the latest secret weapon of the pros.